An elegant cane with a special narrow neck which some users find more comfortable to use as the first and second fingers are thereby positioned closer together than is the case with a standard cane. 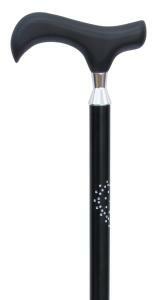 The cane features a decorative heart shaped 'constellation' engraving 7cm below the silver-coloured neck of the cane. Fitted with a black wood derby handle, this aluminium cane adjusts from 79 to 102cm, making it suitable for users of a wide range of heights. Fitted with a black non-slip rubber ferrule.